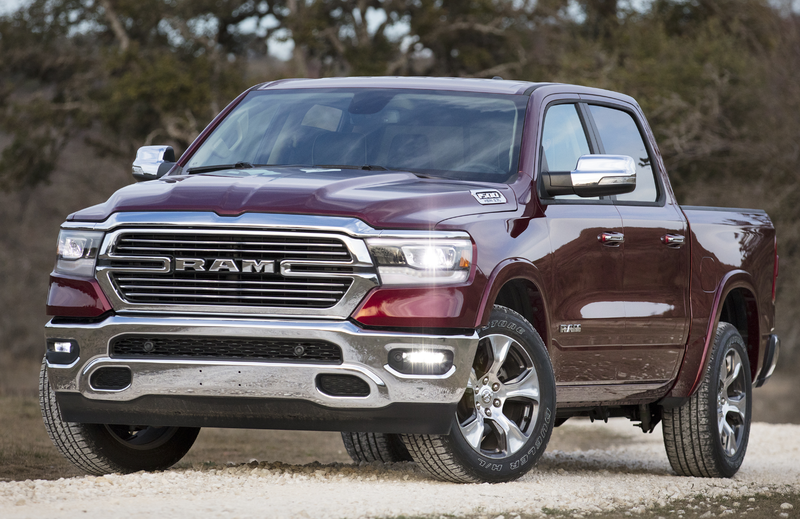 It’s almost an accolade that the Ram 1500 pickup, last redesigned more than a decade ago, has continued to hold its own against far newer rivals. And now, with the redesigned Ram hitting the streets shortly as a 2019 model, those rivals could have even more to worry about. However, it’s not always a given that “new” translates into “better,” and since the old version has long been a Consumer Guide® Best Buy, we approached this redesign of an old favorite with just a bit of trepidation. Turns out … not to worry. Although news has certainly been made with lighter overall weight, better aerodynamics, greater crew-cab passenger space, increased payload and towing capacity, more fuel-efficient engines, and – of course – freshened styling, perhaps most notable to the majority of buyers is the addition of numerous new high-tech safety and convenience features. A new “shark fin” on the 2019 Ram’s roof replaces a traditional antenna, the bumper incorporates dual-level steps and adds an available drop-down lower step, and the famed RamBoxes add upper lighting and an available 115-volt outlet. For a long time, pickups greatly lagged their automotive counterparts when it came to feature availability, but no more; today, the breed offers virtually anything that can be had in midsize cars, and even some midsize luxury cars. Though that often pushes prices well past $60,000, buyers don’t seem to be fazed – the sales numbers of high-end full-size pickups continue to amaze. Another thing that likely continues to amaze – at least to what used to be called “traditional” pickup buyers – is the popularity of extended- and crew-cab body styles with shorter-than-full-size beds. It’s been years since a regular cab has been offered in the compact-pickup segment, and they’re becoming second-class citizens even among full-size entries. In fact, the 2019 Ram will be offered – at least initially – only in Quad Cab (extended) and Crew Cab styles, though 2018 versions will still be available in regular-cab configurations, at least for a while (and probably until 2019 regular cabs debut). Both the Quad Cab and Crew Cab can seat up to six passengers, with the Crew Cab (having a 4-inch-longer cab than last year’s) boasting a limousine-like 45.2 inches of rear legroom. Quad Cabs come with a 6’4″ bed, while Crew Cabs are offered with either a 5’7″ or 6’4″ bed. “We don’t need no stinkin’ badges” … but the Ram has them anyway — and they really stand out. To start, at least, the 2019 Ram will be offered in those two body styles with rear-wheel drive, part-time 4-wheel drive, or full-time 4-wheel drive in six trim levels, but only one powertrain: a returning 395-horsepower 5.7-liter Hemi V8 and 8-speed automatic transmission. Due later this year are mild-hybrid versions of both the Hemi and last year’s 3.6-liter V6 wearing the “eTorque” moniker. This system uses a 48-volt motor/generator in place of a traditional 12-volt alternator to provide quick start/stop capability, a bit of increased low-end torque for better acceleration and fuel economy, and some regenerative braking to recharge the system’s small lithium-ion battery and potentially reduce brake wear. (There remains a traditional 12-volt battery, electrical system, and starter motor, but the last is used only for initial cold start.) And due to return after that – probably early in the 2019 calendar year – is the 3.0-liter turbodiesel engine offered in 2018 models. 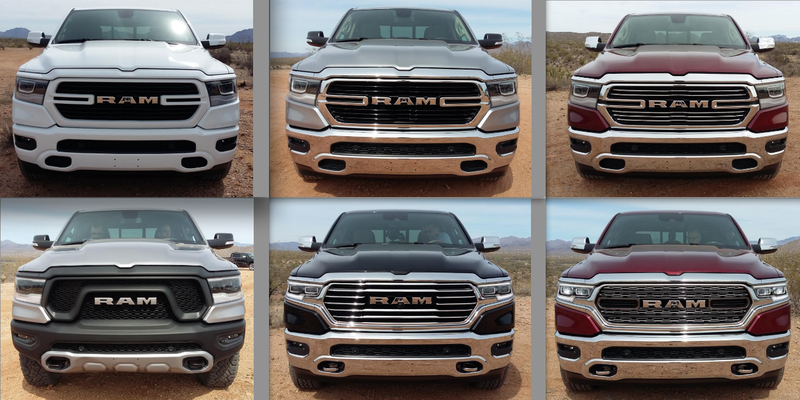 Six faces of Ram: Each of the half-dozen Ram trim levels has a distinct front end, ranging from sporty to rugged to luxurious — just like the trucks themselves. At least initially – in Double Cab/V8/rear-wheel-drive form – the new Ram will start at $33,340 (including $1645 destination) in base Tradesman trim. Above that are Big Horn, Laramie, off-road-oriented Rebel, Longhorn, and top-line Limited, the last starting at $57,130. In general, 4-wheel drive adds $3500, while jumping from the Quad Cab to a Crew Cab adds $2700 with the 5’7″ bed, $3000 ($300 more) with the 6’4″ bed. Dozens of combinations are available, of course, but one popular pricing example would be a Laramie 4×4 Crew Cab with 5’7″ bed, which starts at $48,535. Due to a combination of lighter weight, bigger brakes, and drivetrain modifications, maximum cargo and towing capacities have increased to 2300 and 12,750 pounds, respectively. Fuel-economy figures had not been released at the time of the preview, but Ram expects Hemi models to do a bit better than before, with upcoming eTorque versions of the V6 and Hemi to be up by about 10 percent over comparable 2018 models. 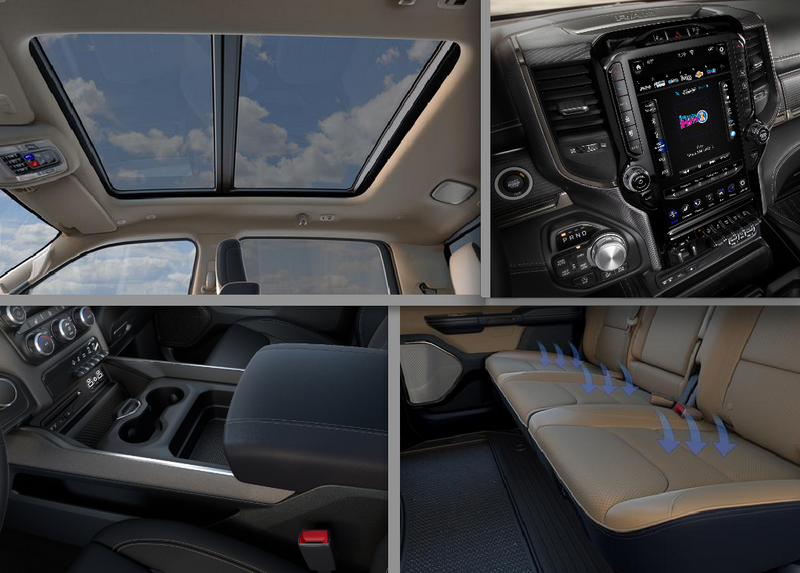 Newly available interior features include (clockwise from top left): a panoramic dual-pane sunroof, a 12-inch infotainment screen, heated and ventilated rear (and front) seats, and a huge multi-configurable center console box. But perhaps most notable to buyers are the high-end features offered, many being new for 2019. These include power-adjustable pedals, 4-way power lumbar adjustment on both front seats, heated and ventilated front and rear seats, an available 12-inch touchscreen, SiriusXM 360L “personalized listening experience,” 4G Wi-Fi hotspot, panoramic sunroof, 360-degree cameras, integrated wireless charging pad, Apple CarPlay/Android Auto functionality, new Type C/A USB ports, 115-volt/400 watt AC outlets, power-release tailgate with hand-swipe feature, 4-corner air suspension, electronic-locking rear differential, hill-descent control, ParkSense parallel and perpendicular park assist, and tire-fill alert that sounds the horn when the proper pressure is reached. Available safety features have been broadened to include forward collision warning and mitigation, blind-spot and rear-cross-traffic alert, lane-departure warning and mitigation, front and rear obstacle detection with automatic braking when in reverse, and adaptive headlights that turn with the steering wheel. Models with a bench front seat can carry up to six passengers. Flipping up the center seat cushion (the seat has its own seat/shoulder belt) reveals a large storage bin underneath, while folding down the backrest creates a roomy center console. In back, flipping up the seat cushion leaves a good-size passage with a flat load floor (Quad Cab shown). Note also that the rear headrests can be folded down to clear the view straight back. One unusual feature of the Ram has long been its coil-spring rear suspension (vs. traditional leaf springs on all competitors) that helps provide an exceptionally smooth ride for a pickup. That has been maintained, and the available (class-exclusive) four-corner air suspension adds the ability to raise the truck a few inches from its normal setting for increased ground clearance (up to 10.7 inches, or 11.7 with the Off-Road Package) or lower it a bit to ease entry/exit. With either the standard or air suspension, we found the Ram to ride exceptionally well — and on the highway, very quietly — again making this a strong selling point. While the Hemi V8 has always been plenty potent enough — and continues to offer a satisfying full-throttle snap off the line and good passing power — fuel economy always seemed to lag that of most competitors. We haven’t had an opportunity to test to see whether the 2019’s lighter weight, active front shutters and air dam, and more-efficient driveline make a difference (and neither, apparently, has the EPA), but it’s almost certain the upcoming eTorque mild-hybrid engines will. 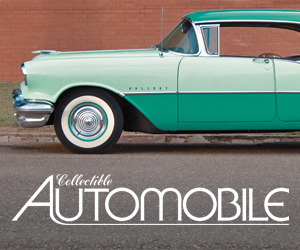 More on that once we get to drive an example around our Chicagoland headquarters. Several combinations of lavishly trimmed two-tone interiors are offered on the new Ram, bringing it in line with some luxury-level cars. An exception is the Rebel’s available red-trimmed cabin shown at bottom right, which is more in keeping with its rugged demeanor. One area where we did notice improvement is in cabin-storage capability — which was already really good. The interior includes numerous places to stash stuff, including upper and lower gloveboxes, a dashtop bin, console side pockets, and very large map pockets in the doors along with smaller door bins. Models with front bucket seats include a huge console box (Ram says it’s nearly twice the capacity of GM’s or Ford’s) that has dedicated phone slots that can be fitted with wireless-charging pads, while those with a 3-person bench (middle riders getting their own seat/shoulder belt) include a slide-out dash tray and other trays in front of and beneath the flip-up center seat. In the rear-seat area, the floor is now flat, and in combination with flip-up cushions, allows large items (like a TV) to be easily carried, and on Crew Cabs, there are storage bins beneath the seat cushions as well as large available in-floor bins. In the cargo bed, Ram’s unique RamBoxes return — now with overhead lights and available 115-volt outlets — and rear bumpers have built-in dual-level steps and an available fold-down lower step. Seating space is good in Quad Cabs, great in Crew Cabs, which now can be had with a sliding/reclining rear seat back. The limitation in Quad Cabs is in rear legroom, which virtually disappears if the seat ahead is pushed all the way back — though it goes really far back. Thus the rule is that if front-seaters are especially tall and expect to seat adults behind them, go for the Crew Cab. Neat cabin details abound, including a mix of materials and some interesting (and varied) wood trim. Interiors, at least in upper-line models, offer seriously luxurious accommodations. A number of two-tone combinations are available (including some quite unusual ones) along with various types of wood trim and neat accents. 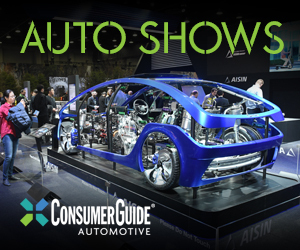 While we didn’t have an opportunity to run the newly available 12-inch infotainment screen through its paces, most buyers will probably get the 8.4-inch screen, which remains among the easiest to use. 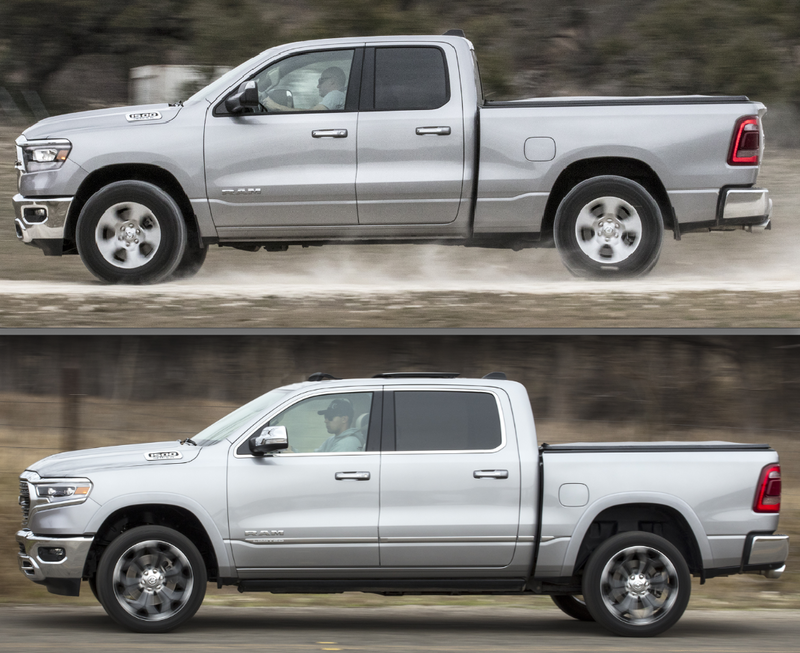 Initially offered only in Quad Cab (top) and Crew Cab form, the redesigned 2019 Ram will be sold alongside 2018 models that continue to offer regular-cab versions — at least for a while. Quad Cab comes with a 6’4″ bed that’s optional on the Crew Cab in place of the 5’7″ bed shown. Written by: Rick Cotta on March 20, 2018.